2 Days in Portland: Dinner at The Woodsman Tavern, drinks at Whiskey Soda Lounge, and beers at Rogue Distillery & Pub on August 26 and 27, 2012. 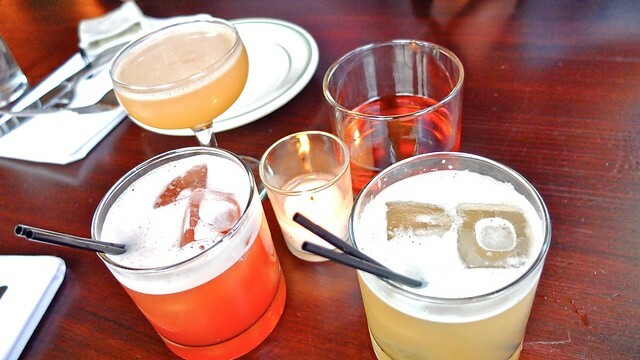 For our first full meal in PDX, we hit up this Eastside tavern for a fine dinner and drinks. 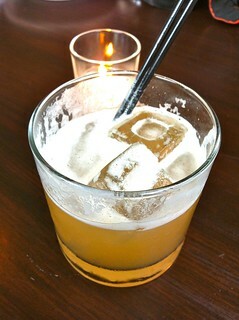 I sipped on a refreshing Omaha bourbon (with lime juice, lavender, and vanilla sugar) cocktail. 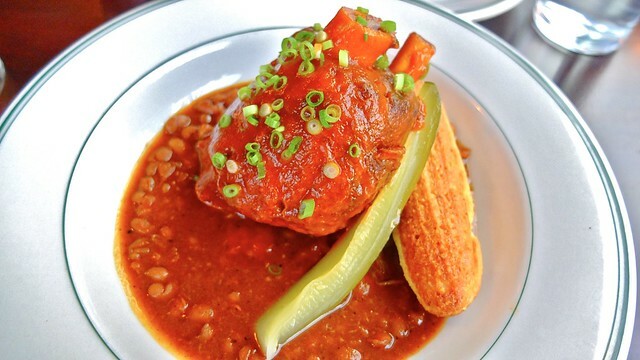 I ordered the crispy pork shank with oven baked beans, stonefruit barbeque sauce, and cornbread. I found the dish quite good and satisfying. The pork was perfectly marinated and cooked with a big portion. 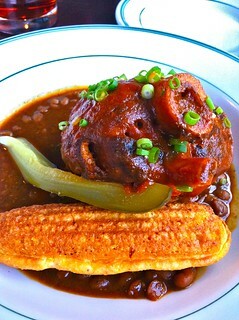 The beans complimented the pork well. 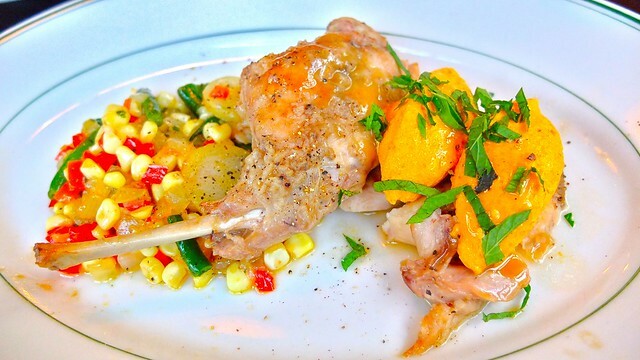 The braised rabbit with carrot gnudi, summer vegetable succotash, and herb butter was tender and delectable. It was a nice cut of meat and well presented. 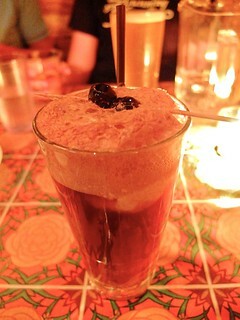 Afterwards, we hit up Whiskey Soda Lounge where I drank a whiskey soda float (right) with homemade bourbon ice cream and a brace of amarena cherries on top. 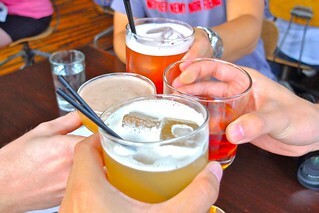 It was amazing and one of the most satisfying, tastiest drinks I've had. Also, their spicy mussels were great. 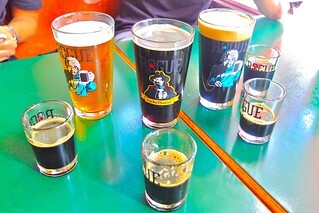 Over at Rogue, we had some local beers. 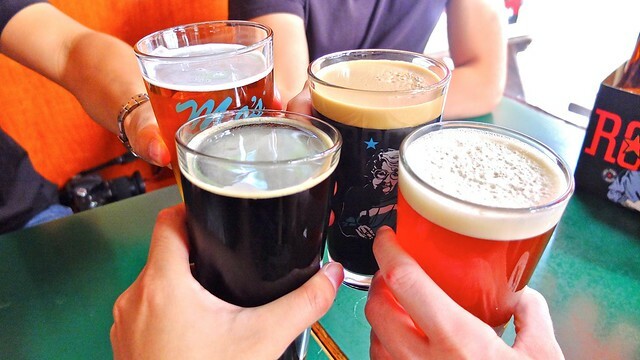 I had the rich mocha porter and we all tried tasters of black lager. The food was okay. I was not pleased I had to construct my own fish tacos from a plate of ingredients. The chili bowl was big and filling as was the American kobe beef burger and chili dog. I wasn't as big a fan of Rogue as it proved to be more of a standard pub with an admittedly deep selection of beer. Funny story, when our server gave back our IDs, he handed my caucasian friend his and then looked at the other three (from three Asian guys), was confused being unable to decipher who was who, and casually laid them on the table, backing away awkwardly. I found it amusing.